UCF Baseball opened the 2018 season this past weekend with high expectations after a regular season AAC Championship in 2017. Things started well on Friday, with the Knights picking up a 6-3 win over No. 15 Virginia. From there, things went downhill as they blew late leads on Saturday and Sunday against Rice and Samford. Here are three takeaways from UCF’s opening weekend. 1. There are still some early-season issues to work out. UCF played a clean game on Friday night with good starting pitching from Chris Williams, excellent relief work from newcomer J.J. Montgomery and some big hits from Rylan Thomas and Dallas Beaver. But the next two days were much sloppier. The Knights made a combined six errors on Saturday and Sunday, with those mistakes playing key roles in both losses. Coach Greg Lovelady expected defense to be a strength of his team, so the coming weeks will decide if this weekend was a rarity. Two of Rice’s five runs on Saturday were unearned, while Samford scored an unearned run on Sunday. UCF lost both games by one run. Defense wasn’t the only issue to come up over the weekend. The bullpen, which was a major strength in 2017 and figured to be strong again this year, got off to a rough start. On Saturday, UCF led 2-1 in the eighth inning before Eric Hepple allowed a two-run home run. Jaylyn Whitehead then allowed two runs (one earned) in the ninth. In Sunday’s loss, preseason All-American Bryce Tucker allowed three runs (two earned) in the ninth. It’s not as if the bullpen is in trouble, though. It was obviously the first in-game action of the season for Hepple, Whitehead and Tucker, so there’s no need to panic. Plus, Montgomery, Thad Ward and Cre Finfrock were all very good in their 2018 debuts. 2. Starting pitching, as expected, looked solid for the Knights. Starting pitching was good for UCF in 2017, but it could be even better in 2018. The rotation got out to a great start over the weekend. Chris Williams threw five innings of three-run baseball on Friday night against No. 15 Virginia, earning the victory. Joe Sheridan then delivered six scoreless innings of three-hit ball on Saturday before newcomer Jordan Spicer struck out seven and allowed just two runs in Sunday’s game. The weekend starters allowed a combined five runs in 16 innings. They showed promising control, giving up just one walk. All three pitchers left their respective starts with a lead intact. On Saturday and Sunday, those leads eventually disappeared, but by no fault of Sheridan or Spicer. Having a consistent Sunday starter is a luxury that a lot of teams don’t have. So, if Spicer, who transferred from Polk State College, can continue to pitch well, UCF will be in great shape. J.J. Montgomery and Thad Ward, who pitched well out of the bullpen this weekend, will eventually figure into the starting rotation for the Knights. Montgomery allowed one hit and struck out six in four innings on Friday night, while Ward allowed an unearned run in one inning of work on Saturday. Ward is slated to start at Stetson on Tuesday night. 3. There is absolutely zero reason to panic about UCF’s 1-2 record. UCF did run into issues with defense and their bullpen on Saturday and Sunday. The Knights also went cold offensively for much of Saturday’s game. But despite the problems from games two and three, there is no reason to panic about the outlook of the team going forward. The fact of the matter is, UCF legitimately could have finished the weekend 3-0. There’s a reason Baseball America only dropped the Knights from No. 22 to No. 24 in this week’s rankings. First of all, the win over a top-15 team in Virginia was huge for UCF. The Cavaliers went 43-16 last year and won the College World Series in 2015. And while the two losses on Saturday and Sunday hurt, both came against quality teams. Rice is a perennial Conference USA contender and has made the NCAA Tournament 23 years in a row. Samford has won 30-plus games in 10 of the last 12 seasons. It’s not as if UCF lost to bottom-dwellers, so in reality, the two losses won’t hurt its RPI in the long run. Not only was the weekend schedule a tough one, but the Knights showed flashes of potential throughout. The starting pitching was a positive, while newcomers in the lineup started the season on the right foot. Ray Alejo picked up four hits, scored four runs and stole five bases in five attempts. Brandon Hernandez picked up four hits and Tyler Osik delivered three. Returning players Rylan Thomas and Dallas Beaver both went deep on Friday night and Matthew Mika stole two bases. There was a lot to like about the talent on the roster heading into the weekend and two tough losses aren’t enough to change that. No. 24 UCF returns to the field on Tuesday, taking on Stetson (3-0) in DeLand. First pitch is scheduled for 6:30 p.m. 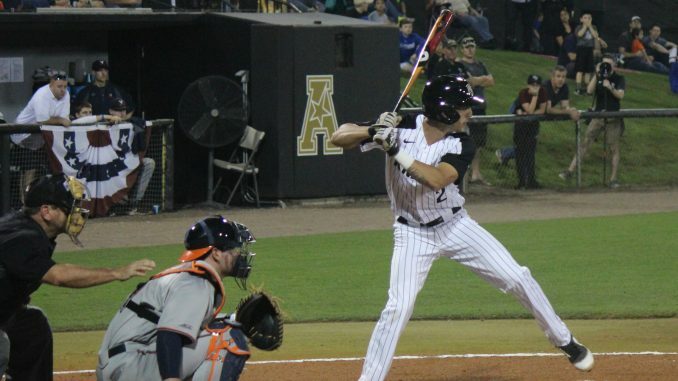 The Knights then return home this weekend for a three-game series against Savannah State.